For busy professionals needing to learn and speak a local language, the options are limited. Enter South African ed-tech startup Uthini. 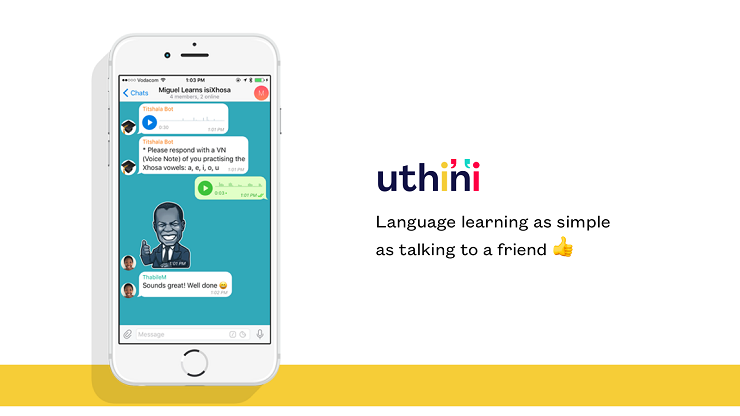 Formed in 2016, Uthini is a person-to-person (P2P) language learning-platform that connects first language speakers with students, using a structured learning path. The learning process is supported by chatbot technology, which the first language speaker uses as a tool to provide convenient, byte-size and personalised language learning to students. Uthini has already begun providing an isiZulu language programme to third and fourth year medical school students at the Johannesburg-based University of the Witwatersrand. This began at the end of February, and will last for eight months. Approximately 550 students are currently taking part in the programme, taught by over 65 isiZulu home language tutors – the majority of which are university students. Uthini is also offering subscription-based isiXhosa and isiZulu basics to the general public. Uthini came about after co-founders Miguel Da Costa and Thomas Wrigley asked themselves how they could make a meaningful impact on South Africa. “We had long desired to build and implement ideas and solutions which meaningfully and sustainably improve the lives of others,” Da Costa told Disrupt Africa. Uthini – which is a Zulu and Xhosa word meaning “what are you saying?” – is helping connect and reconcile South Africans to one another while also enabling mother-tongue indigenous language speakers to earn money and benefit economically from their language knowledge, something that has not generally been possible in any other setting. “Language is a socio-cognitive process and effective language learning therefore requires meaningful social interaction. At present, language learning options either involve lots of human interaction or little to no human interaction,” Da Costa said. Video-chat based tutoring platforms like Verbling are slightly cheaper and more convenient, he said, but lack the structure of courses and still require large chunks of time, high bandwidth internet connection and mid-to-high-end hardware, while apps offer little to no human interaction or opportunity to actually use the language. “Very little investment in the platform by users and vice versa also leads to very high dropout rates. Some platforms like Livemocha tried to include greater levels of interactivity, but operated more like a forum than a meaningful conversation and had little control over the quality of feedback,” said Da Costa. Uthini, however, provides the convenience and accessibility of apps, and the structure and high levels of individualised interpersonal interaction of courses, but can maintain control over the quality of the course content, monitor the quality of feedback provided, and widen the pool of available facilitators. Da Costa said this makes high-quality, effective language learning far more accessible and more affordable than ever before. In South Africa, he does not think there is much competition. “In terms of local language competitors, there is no high-touch – think GetSmarter – mobile or online based competitor for local languages such as isiXhosa or isiZulu. The current offerings comprise of traditional language schools, self-study, or studying through high school or university,” he said. Uthini’s approach consists of significant human interaction, like at language schools, but also allows the student to do lessons in their own time and wherever they are, like self-study. “In this way, we attempt to incorporate the most useful elements of traditional, digital and independent language learning,” said Da Costa. The startup, which was self-funded until it was selected to take part in the Cape Town-based Injini ed-tech incubator at the end of last year, charges institutions or individual users a subscription fee that provides them with 12 lessons of 15 minutes per month. Da Costa said building a user base had been challenging, but Uthini was now looking to expand outside of South Africa. “Going from MVP to a mass scale pilot of more than 600 users was a significant challenge, but we were able to learn a significant amount from it. That being said, we’ve been fortunate to be a part of the Injini incubator and have had some great mentors who have supported us all along the way and helped offset these difficulties,” he said.